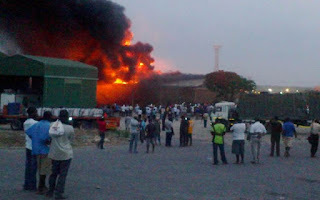 THIEVES have besieged the burnt State warehouse at Beitbridge Border Post where they are targeting mostly copper cables and related products still trapped under the debris, it has emerged. In January this year, property worth approximately RTGS$190 000 was destroyed when the warehouse on the commercial exports section caught fire. The cause of the fire is still under investigation. The warehouse was full of an assortment of goods intercepted from travellers for non-compliance with customs laws in the preceding 18 months. The Chronicle has established that so far eight people have been arrested at the border for stealing copper cables and related products from the damaged warehouse. These were arrested in the last six weeks and have been taken to court charged with theft. In most cases the suspects are being apprehended by guards employed by a private security company hired by the Zimbabwe Revenue Authority to beef up security. Those who have since been arrested and convicted for theft at the local magistrate’s court include Daniel Sibanda, Bumanu Mudau, Stephen Simango, Mlambo Munashe, Kennias Mlambo, Munyaradzi Mlambo and Nicholas Moyo and were jailed for between three and 12 months. Matabeleland South police spokesman Chief Inspector Philisani Ndebele could not give the latest statistics on those who have been arrested at the border, but said theft of copper cables and telephone cables was common in the area. “I can’t give statistics at the moment. However, we have been arresting a number of suspects linked to theft of copper cables and telephone cables around the province,” he said. Sources close to the border town alleged that it was apparent the suspects were fully aware of the goods that were burnt down in the warehouse in January this year. “It appears these people have full knowledge of the nature of goods which were being kept at that warehouse. “In addition, it is important for Zimra to fully secure their properties to avoid the recurrence of such cases,” said a source who preferred anonymity. The warehouse on the export side was the fourth in five years to go up in smoke. Three other state warehouses at Beitbridge have been burnt under unclear circumstances since 2014. However, a fourth warehouse was in July 2016 looted and burnt by hoodlums calling themselves Combined Beitbridge Residents Association. They were demonstrating against the implementation of Statutory Instrument 64, which removed specified goods from the Open General Import Licence (OGIL). At the moment Zimra is relying on two make shift warehouses at Beitbridge. The revenue authority has since committed RTGS$250 000 to repair damage caused by storms at the border post this year, excluding the damaged warehouses.